Physical Description A tall statuesque beauty, she is soft spoken and curt. She is exceptionally lithe and knows eight different forms of martial arts including Aikido and the Mok Bara. She rarely keeps her hair down, as she rather enjoys showing off her spots. Ambitions Daynah is afraid of herself really. She feels that she is worthless if it was not for the Ral symbiote she would be nothing. This is of course untrue but she has nightmares of waking up without Ral and loosing all of her knowledge, her intelligence. She also has arachnophobia. She hopes to one day become a Starfleet Captain like one of her previous hosts. She further hopes that one day the galaxy will arrive at a state where Starfleet can demilitarize and concentrate on the pure science. She wants to be a part of this goal. Daynah's ambition is quite simple... Galactic Peace so that pure science can be pursued. She has been compared to Vulcans in this matter. Hobbies & Interests Much of her hobbies are inherited from Ral. She loves Football, Fencing, and Renaissance sword play. She is an avid fan of Trill and Betazoid poetry. She is also exceptionally good at Dabo and Dam Ja'at. For music she loves Klingon and Vulcan in particular as well as an old Earth genre of music Rock and Roll. The part of her that is Rodan Ral plays the guitar and harp. Rodan Ral, born Rodan Liyrn, was a renowned musician and widely recognized composer on Trill. Specializing in stringed instruments of all sorts, Rodan was responsible for some of the most monumental pieces of music since long before the age of information. Eliza Ral, born Eliza Toran, was considered one of the great scientists of her time. Her work on molecular biology and nanotechnology advanced the Trill civilization and helped cure many of the common health issues of the day. She was a strong willed woman who was rarely wrong. If she didn't know the answer, she would find it before putting herself on the line. With a love for discovery, Eliza provided the Ral symbiont with a very unique host. This knowledge and the experiences gained from her life have come in handy many times over the years since. Alaryc Ral, born Alaryc Ilyan, was a lifetime Starfleet officer. He was one of the first Trill to climb through the ranks and become a Captain of his own ship. Unlike previous hosts, Alaryc chose to go a more military route, believing that Starfleet was doing good in the galaxy, and he wanted to help. Alaryc was joined at the age of 20 with the Ral symbiont. It was upon his completion of the program, and the subsequent joining of the two, that he decided to apply to Starfleet Academy. His four years took him to many places on Earth, but one of them was a list of potential future command officers. He lived up to the compliment, and excelled out in the field. Following an attack on the USS Valor by Dominion forces scouting his location just before the war broke out, Alaryc suffers a mortal wound and is killed. With little choice, the Ral Symbiont is passed to the only possible candidate other than a human; Jazra - the daughter of a joined Trill officer who also dies in the attacks. Because Ral is deemed more important, the symbiont in the other officer is allowed to perish in the chaos. Jazra Ral, born Jazra Keyler, was the host that lived the shortest life. She applied for and was accepted to the University of Betazed in Medara shortly before the Dominion war began. 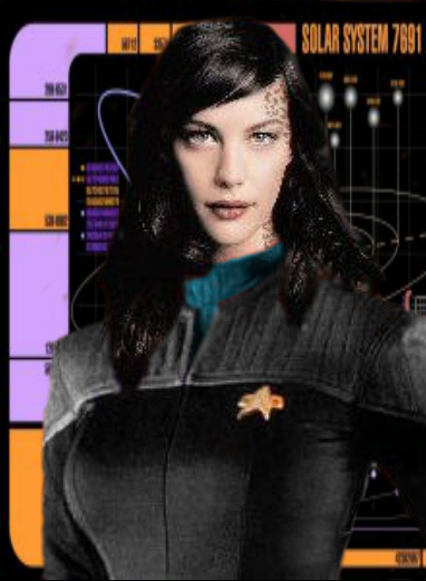 The daughter of Starfleet Officers killed aboard the USS Valor, she received the Ral symbiont following an attack on the Valor that took both her parents, the Captain, and other members of the crew. Asking to be dropped off on the planet following the tragedy, she put everything she had into her studies and new life there, leaving as much of the Valor behind. The days that followed were a blur to her and the Ral symbiont. Fading in and out of an awakened state, she was barely aware of her surroundings. On the third day of her captivity, she noticed changes around her. Shortly thereafter, she found herself in a medical center, where her remaining friends were on hand to say goodbye. Trill had sent a replacement host as soon as Jazra had been rescued by a mission that she would later find out was spearheaded by Jaxx himself. With wounds that would kill her, and a new host on hand, Jazra spoke her last words to her friends, but was never able to say what she wanted to Jaxx. Fearing that the circumstances would effect him for the rest of his life, she vowed to one day find him and really say what she had meant to that day. Norah Ral, born Norah Sytar, is the fifth host for the Ral symbiont. He was a special case in that he was older than normally allowed in the symbiosis program. Norah, as a highly successful diplomat, had been requested for joining rather than having applied for it. He was older - 65 to be exact - but the knowledge he could imprint onto the symbiont was well worth the risks of joining the same symbiont too often throughout the course of time. In 2374, Norah is brought to Betazed under the relative safety of the diplomatic corps, where he is joined to the Ral symbiont before leaving the world once again. Norah served as a diplomat for 8 years before being joined. Unfortunately one year after the joining Norah suffered heart failure and dying on Trill with his family. His successor, Daynah, was already prepared. The joining was uneventful and the new host soon acclimated to the symbiont. Daynah Ral, born Daynah Sanj, is the sixth host for the Ral symbiont and was mentored by Sanah Tyx. She was a young trill with no specific career path. However, since the joining she chose not only to pursue the sciences like one of her previous hosts, but enroll in Starfleet Academy. After having the experiences of the past lives, Ral had decided that roaming the galaxy and learning about the many species around her was a good calling. So for her first two years after the joining she tended bar at various Starfleet instillations. She stayed around Starfleet as she enjoys the familiarity of Starfleet coupled with the variety of people and stories that populate such areas. In between jobs, Daynah found herself on Starbase 118 for a short period of time during which she learned of the Victory. She wasn't sure if she had been looking for it, or if it had just appeared, but she stopped when her eye caught the name, Jaxx. Acting captain of the Victory. With a quick smile, she decided to find a way aboard. Applying for a civilian position, she was quickly accepted and sent to meet with him. Taking only a few things with her, she felt a renewed fervor. She needed to say something, and it was already way past due. Though unsure of herself in the first few days of the assignment on the Victory, Daynah soon settles into her job as the owner and operator of 'The Retreat'; the Victory's lounge and relaxation spot for many of the officers aboard the ship. Throughout her time there, she offers good food and friendship, along with an open ear to those who just needed to talk. As time goes on, she finds herself close to many of the members of the senior staff, but one more than the others. Following a short trip to Luna with a group of officers, Daynah finds herself pulled towards one of them; the Chief of Security, Liam Frost. The crew finds themselves soon stationed on Starbase 118, where Ral makes plans to open up a new version of The Retreat in a small area of the commercial sector near a window to the outside realm of space. The restaurant is short lived, however, as Daynah finds out Liam will have to leave for the USS Apollo shortly after shore leave on Echevarria. To his surprise, she wholly agrees on following him to the Apollo, not knowing that Starfleet Command wants her there. En route to her new home, currently docked at Utopia Planitia, Daynah encounters a face from the symbiont's past. The current Captain of the USS Alabama, and a former XO of Alaryc Ral, tells Daynah of Starfleet's request for her to serve as a civilian advisor about the Apollo. Captain Alaryc Ral spent many years within the Typhon Expanse aboard his own command and Starfleet feels that it would be important to have his memories available to the crew of the Apollo. Because the Expanse is so strange and somewhat deadly, Daynah reluctantly agrees. As part of the deal, Starfleet agrees to remove the block that kept sensitive command level information from the current host so that all of Alaryc's memories are available as needed. Daynah experiences the resurfacing of memories as if she had been just joined, though most of these memories came from Alaryc's time aboard starships. Some memories are good, but many of them give Daynah a sense of both urgency as well as the feeling of being chased by shadows. Following her fundamental role in resolving the crisis with the Borg scout ship, Captain Jaxx tells Daynah that she has been granted entrance into Starfleet Academy. She is in no position to refuse, and Jaxx doesn't take no for an answer, so she reluctantly agrees to go to Earth. Between her own exceptional intelligence and the presence of Ral Starfleet Academy was a walk in the park. She graduated with honors and with a dual major in Temproal Mechanics and Xenobiology. Ral was quickly sought after by many Captain's to serve aboard their ships. Her first assignment was to the USS Roosevelt as a Astrometrics Officer. It was here that she served with distinction and spent many a night in the lab simply mapping. Her own extensive knowledge of the galaxy around her allowed the database to be doubled. Two years after her assignment to the Roosevelt she was promoted to Lieutenant Junior Grade for her efforts. She is next assigned to the USS Apollo of all places this time to serve as Assistant Chief Science Officer. She rather enjoyed serving on the Apollo and catching up with old friends all the while making new ones. Three years into her time on the Apollo the ship was tasked with a first contact mission. It was Daynah's knowledge of Xenobiology which allowed her to figure out that the aliens secrete a pheromone that is lethal to humans. She worked with the Apollo's Chief Medical Officer to figure out an inoculation for it. She was promoted to Lieutenant for going above and beyond the call of duty. While she loved her time on the Apollo. After nine years on one ship she got filled with wanderlust. 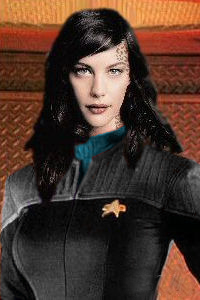 She asked for and was granted a transfer to the USS Orion as the Chief Science Officer. 2375 - Daynah Sanj is joined with the symbiote known as Ral in the joining ceremony. Daynah is 18 years of age. This creates the being known as Daynah Ral.